We all use more than one browser on our system nowadays and with the typical setup, you have to configure SQUID server IP on individual browsers so that all the request pass through the SQUID proxy server. A better way is to configure SQUID server to act as a transparent proxy server and update the client machine’s gateway to use SQUID server’s IP address. That way you don’t have to update proxy server’s IP address on all the browsers that you use on your system. 3. Now, set the gateway on all your client machine to the IP address of your SQUID proxy server. That’s it. Now, all requests on your client machines will be routed via SQUID server no matter how many different browsers you use. Here is a simple way on how you can set up a muti-node Apache Web server cluster that provides load balancing. In front of the apache cluster I have created a load balancer that splits up the incoming HTTP/HTTPS requests between the multiple Apache nodes. The advantage of using a load balancer is that it takes care of the load on the web server nodes and tries to direct requests to the node with less load and it also takes care of the sessions. 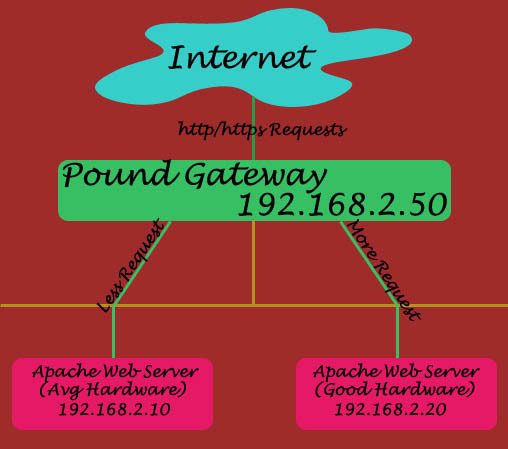 For our setup we configure a program called Pound and behind this pound server, we have two apache webserver nodes. Pound is a reverse-proxy server. This means that it passes requests from client browsers to one or more back-end servers. Also, Pound acts as a load balancer as it distributes the requests from the client browsers among serveral back-end servers, while keeping session information. Pound is aso an SSL wrapper that can decrypt HTTPS requests from client browsers and pass them as plain HTTP to the back-end servers. Pound can verify requests for correctness and accept only well formed ones. Pound can detect when the backend server fails or is recovered and take actions accordingly. So, it’s also a failover server. We can set priority for preferred back end server in case a particular server has a better hardware to accomodate the heavy load. If priority is not set, it takes the default priority as 5 and the priority ranges from 1 to 9; 9 being the highest priority. Remember that Pound is NOT a Web Server or Web Accelerator. So, no websites are cached. Also, Pound is a session-aware server, meaning it keeps track of sessions between a client browser and a back-end server. So, once a session is established, all subsequent requests from the same browser will be directed to the same back-end server. In the above configuration, you can see “Session” configured by client IP address. In this scheme Pound directs all requests from the same client IP address to the same back-end server within a five-minute interval. Though Pound is session-aware, accuracy is NOT guaranteed as HTTP is defined as a stateless protocol. There are five other ways to configure sessions using Pound, but none can guarantee accuracy. The above method of configuring session via IP address is the easiest one, though we have other methods like Basic Authentication, URL parameter, cookie value, HTTP parameter and header value. SSL certificates can also be configured if you add the following to your pound.cfg configuration file. LVM or Logical Volume Manager is a key tool for system administrators managing storage on Linux servers. LVM introduces three layers of abstraction b/n the underlying storage devices on a Linux server and the file system which is accessed by the users. This example has 3 hard drive devices – sdc1, sdd1 and sde. We will use LVM to aggregate these 3 hard drives to provide storage, extend 3 formatted file system and mount it under a directory called ‘/lvmdata’. This additional abstraction between the underlying storage devices and the user accessible file system enables us to manage storage more effectively and with greater flexibility. Let’s discuss each LVM layer in sequence and take a look at some specific command used to configure each layer. The 1st layer is know as LVM Physical Volumes (PV’s). A storage device must be formatted as a Physical Volume (PV) before it can participate in the LVM infrastructure that we will be building. You can check the newly created PV using the command ‘pvdisplay’. This command shows the 2 physcal volumes (sdc1 and sdd1) that we used right now. Next we need to aggregate the PV into a single contiguous pool of storage known as Volume Group (VG). You can check the newly created VG using ‘vgdisplay’ command. VGdisplay tells you the volume group name, how much size the volume has and so on. Finally, we need to carve out a section of VG that we can then place our file system on. This carved out piece of storage is known as Logical Volume (LV). You can check the newly created LV using the command ‘lvdisplay’. Now, create a file system, create a mount point (/lvmdata/) and then finally mount the new LVM file system back to the mount point. We can now expand our /lvmdata filesystem in real time while all the data remains online and fully accessible. You can see the new LVM (/lvmdata/) partition which is of 1 gig in size. Remember, all this was done without unmounting the filesystem and all the data remained intact and accessible to users. Imagine you want to migrate all your data from your servers local hard drive to a SAN (Storage Area Network). Using LVM you can easily accomplish this task. First we need to initialize our SAN storage using pvcreate. Then we can extend our existing Volume Group (VG) on to our new SAN device using ‘vgextend’. Again, this was done in real time when the file system data remained online and fully accessible to the users. Recently one of my friend unknowingly deleted /dev/null file and it was throwing error when he tried to launch the terminal console. So, what exactly is the file /dev/null ? /dev/null is a character special file, which means that it is a contentless file that is marked as being able to source and sink byte streams to it. What happens to those streams is determined by their device numbers. Character special files are like most other files in many respects, and can be deleted if you have the permissions. But, in order to re-create this file, you should know the major and minor number associated with this character file. In my server, I have major-minor numbers for /dev/null as 1,3. But, what if somebody has already deleted this file, and you want to know the major and minor numbers for /dev/null so you can recreate this file. From the above, you can see the 1 and 3 highlighted in yellow. ‘1’ is the major number and ‘3’ is the minor number. The major number specifies the major device type (for example, the device driver number). The minor number specifies the device location, which is typically, but not always, the unit, drive, and/or line number. mknod is used to create the character and block devices that populates ‘/dev/’. So, the above command is used to create a character (c) device file with major and minor pair of 1,3 and world writable. We all know how to create an iso image of a DVD using ‘dd’ command. But, what if you want to create an iso image of a folder containing lot of files? In the above example, an image ‘mycontent.iso’ will be created under ‘/mnt’ partition for the folder ‘media’. The option ‘-o’ means the output file. An inode is a data structure that contains important information regarding file within a file system. Whenever file system is created in UNIX, a set amount of inode is created. Usually, about 1% of the total file system disk space is allocated to the inode table. Inode and Inumber seems to be same, but they are not. Inode refers to the data structure and the inumber refers to the identification number of the inode. So, inumber is also referred to as inode number. The inode table contains a listing of all inode numbers for the respective file system. When users search for or access a file, the UNIX system searches through the inode table for the correct inode number. When the inode number is found, the command in question can access the inode and make the appropriate changes if applicable. Take, for example, editing a file with vi. When you type vi , the inode number is found in the inode table, allowing you to open the inode. Some attributes are changed during the edit session of vi, and when you have finished and typed :wq, the inode is closed and released. This way, if two users were to try to edit the same file, the inode would already have been assigned to another user ID (UID) in the edit session, and the second editor would have to wait for the inode to be released. How to check the inode number for any file? The inode contains all the information about a file except it’s actual file name and the file contents. The information listed above is important to files and is used heavily in UNIX. Without this information, a file would appear corrupt and unusable. In UNIX, directories are actually files that have a few additional settings in their inodes. A directory is basically a file containing other files. Also, the mode information has flags set to inform the system that the file is actually a directory.